A new break through in IVF treatment- IMSI, now at Arpit Test Tube Baby Centre. Sperm morphology evaluation plays a crucial role in the diagnosis of male fertility potential and it has demonstrated a predictive value for fertilization and pregnancy outcomes in IVF treatments. A new technique has recently been developed within the in vitro fertilization (IVF) field. A new microscope that will allow infertility specialists to pick the best sperm while carrying out the specialized test-tube baby procedure of ICSI. The IMSI method was first developed in 2004 by a team led by Benjamin Bartoov, of Barilan University in Israel, who used IMSI to select those sperms with a shape and size that indicated good genetic quality. The pregnancy rate in patients jumped from 30 % to 66 %. 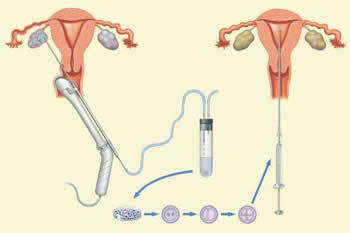 In ICSI technique, an egg is held and injected with a husband sperm, with the help of a machine called micromanipulator. If the husband has no sperms, then sperms are obtained by doing a testicular biopsy. The fertilization occurs outside the woman’s body. The embryo is created outside the body of the mother and then placed inside the mother’s womb. Intra-Cytoplasmic Morphologically Selected Sperm Injection (IMSI) helps magnify the image of the sperm 7,200 times, thereby allowing doctors to pick the best quality sperms. The machine is an advanced version of the earlier technique of Intracytoplasmic Sperm Injection (ICSI), having the magnification capacity of 16 times higher than ICSI. IMSI is a real-time method where sperms are selected just before the microinjection takes place. The higher rate of magnification allows for a view of the internal morphology of the sperms – invisible to conventional inverted microscopes – and makes it possible to avoid choosing those that show anomalies on this level and that might compromise the success of the treatment. IMSI helps improve the success rate among men with the worst prognosis and is said to be more beneficial than ICSI in patients with previous IVF or ICSI failures. It is also useful in couples with unexplained infertility. It has been shown that IMSI resulted in better egg fertilization rates, better quality embryos, better rate of blastocyst formation and therefore better pregnancy rates. The technique has been tested on men that have serious sperm anomalies and also in cases of repeated miscarriages as well as repeated IVF failures. Studies have already demonstrated that patients who underwent IMSI obtained significantly better advantage of over the conventional IVF-ICSI procedure in terms of pregnancy rate and miscarriage rates. This will be a promising technique in daily IVF practice when applied to severe male infertility and repeated failure cases.